Ramtin Seba, Sne — In eastern Kurdistan provinces, just like Turkey, Iranian regime started the policy of excessive and irregular dam constructing. While these government performances do not have any economical reason, rather they are only for social pressure on people and against the ecology of Kurdish regions. Why should only in one Kurdish province 11 dams be in agenda of the government? 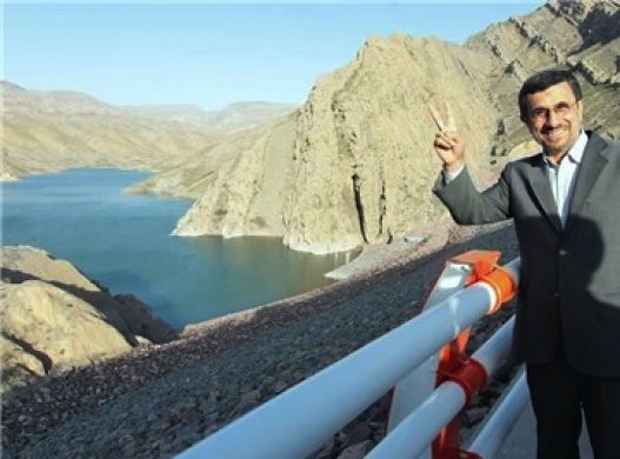 Ahmadinejad raised his hand as mark of colonialist victory beside the “Garan” dam of “Meriwan” which in his opinion it is the victory of his government’s policies against Kurdish nation. While the Sine province has rich water resources and rivers, during recent years with excuses to agricultural development, animal husbandry and creating jobs beside the current dams, creating 11 new dams placed into the agenda of the regime. This policy of the regime is kind of occupying the region with water. Furthermore that in a high level water region like Kurdistan there is no need for constructing dam, under the excuse of development it will immerse many villages and small towns of eastern Kurdistan. The population of these villages and towns inevitably move into cities, subsequently the culture of “village production” will be vanished and instead culture of “consumerism” will be more increased. Such policy in northern Kurdistan and Turkey used to military confrontation with the “People’s Defense Forces” (HPG). The exploitation and authoritarian policy of dam construction in eastern Kurdistan especially Sine, besides resulting in forced migration of huge part of the village population that protected the Kurdish culture, also it is responsible for irreplaceable destruction of ecology and nature of Kurdish regions. With the river current there is a balance in the nature but the hydroelectric projects by disturbing the balance of nature are the greatest enemies of rivers. For constructing these dams in provinces of eastern Kurdistan, the Iranian capitalists which majority of them is the Iranian Revolutionary Guard (IRG) take responsibility of all dam’s projects and the share of Kurdish nations are only being worker. These capitalists especially the Iranian Revolutionary Guard in their projects violate the rights of workers, not only they do not pay the monthly salary of them but also they have beaten them up. Until now tens of Kurdish worker lost their life because of lack of workplace safety. Some of these dams which faced the discontent from Kurdish people and workers are “Jawe”, “Berde Resh”, “Gawshan”, etc. which in unfruitful way have been made from the executive organizations of the government just because of suppression policies benefits, and consultant and manufacturer companies of related to the government, the Iranian Revolutionary Guard and their hireling capitalists trying to show them useful, while they are excessive and beyond the current needs of Kurdish regions.